Honey is the most obvious yield from beekeeping and it enjoys a high level of popularity with consumers, making it a highly marketable product. Each hive of bees can produce anywhere from 20 to 60 pounds of honey on average per year (depending on a variety of factors such as geographic location, weather, temperature, pests, local flora, and more). Some hives can produce much greater amounts under ideal management conditions. Beeswax can be converted into many different products including candles, soap, and lip balm. You’ve probably heard of Burt’s Bees, a highly successful company that began with the creation of beeswax based candles and lip balms. Beeswax prices can vary widely based on the quality and color of the wax. Handmade beeswax based products have been particularly popular in recent years, both in retail stores and online craft markets such as Etsy. Bee pollen granules are cited by many health food enthusiasts as a “superfood” that can boost immunity and provide other health-related benefits such as minimizing seasonal allergies, treating osteoporosis, and acting as an antioxidant. Bee pollen is usually available at natural food stores, health stores, and some drugstores. Most people have never heard of propolis, a sticky and resinous substance that bees use to seal small gaps in the hive. It is purported to have a variety of medical uses including treatment of sores, acting as an antioxidant, and boosting immunity. It is also used in commercial products like cosmetics, car wax, and chewing gum. 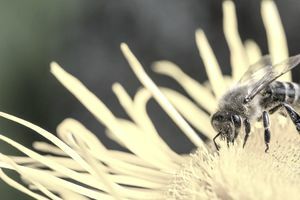 Many agricultural producers will pay to have hives temporarily relocated to their fields to provide pollination services. Hives are generally contracted for service for a period of three to five weeks. Most commercial pollination service operators are located in California, followed by Texas, Florida, North Dakota, South Dakota, and Montana. Almond crops have the highest demand for commercial pollination, followed by sunflower and canola. New bee operations always need stock for starting their hives, and established beekeepers may need replacement bees due to swarming or disease. Many beekeepers establish a profitable sideline for their own honey making or pollinating businesses—providing bees (and custom-built hives or kits) to others in the industry. Bees can, in fact, be shipped through the U.S. Postal Service, making for an interesting visit to the post office for a new hobbyist (and you can be sure everyone will want to get out of your way when they hear the buzz of that shipping container). Beekeeping can be a fun and profitable hobby or business venture, and it is fairly affordable to start up. With proper management, a hive can turn a profit relatively quickly, especially if the beekeeper is willing to consider all the potential streams of revenue. It may be an unusual animal business idea, but beekeeping is certainly something to consider for aspiring animal professionals.